Bike the Columbia River Gorge, the Mt. 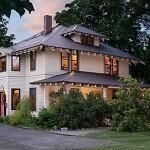 Hood Scenic Byway, the Willamette Valley and have a comfy bed and and hearty breakfast at an bed and breakfast along the way. A Bed and Breakfast offers so much more than a hotel. Oregon innkeepers know the best back roads, the best places to eat, the scenic attractions you won’t want to miss. You determine how far you want to go in one day. The whole adventure is about 200 miles and you’ll discover why those arriving in Oregon on the Oregon Trail called this place “paradise”. Our inn the Old Parkdale Inn B&B is recognized as a BFB and is the halfway point for this tour. Don’t necessarily want to tour? No problem. We invite you to explore the many backroads of the Hood River Valley.